Said to be a comical entertainer, the film will star Akkineni Nagarjuna and Nani in the lead roles while Rashmika Mandanna and Akanksha Singh will be seen playing leading ladies. Tollywood is gearing up for one of the biggest multi-starrers in the upcoming season which is being directed by Shamanthakamani director Sriram Aditya. Said to be a comical entertainer, the film will star Akkineni Nagarjuna and Nani in the lead roles while Rashmika Mandanna and Akanksha Singh will be seen playing leading ladies. The film has been titled Devadas which is excitingly is also the title of Nagarjuna’s father’s film. Devadas will have Nani playing Das and Nagarjuna playing Deva, combining it to be the title. Nani will be seen playing a doctor while Nagarjuna will be seen playing a don in the plot. It was earlier being reported that the film is possibly a remake of Bollywood film Johnny Gaddar starring Neil Nitin Mukesh. However, director Sriram Aditya clarified that the film is a new subject and not a remake of any film. Clarifying all this confusion, director Sriram Aditya took to Twitter and cleared all the air around the film. “My next film with @iamnagarjuna sir and @NameisNani Produced by @VyjayanthiFilms is not a Remake of any film. Its a original script .Just wanted clarify 🙂,” wrote Sriram giving much required clarity to fans. After Ram Gopal Varma’s Officer, actor Nagarjuna will next be seen in this light-hearted comedy, also starring Nani, with which the veteran star says he enters the Munnabhai-territory. “This new film that I am doing with Nani is very much in the Raj Kumar Hirani territory. I play a gangster and Nani plays my doctor. It is a very warm-hearted funny script. And I’ve a feeling director Sriram Adittya will make something special out of it,” says Nagarjuna who has no problem doing two-hero films with younger actors. 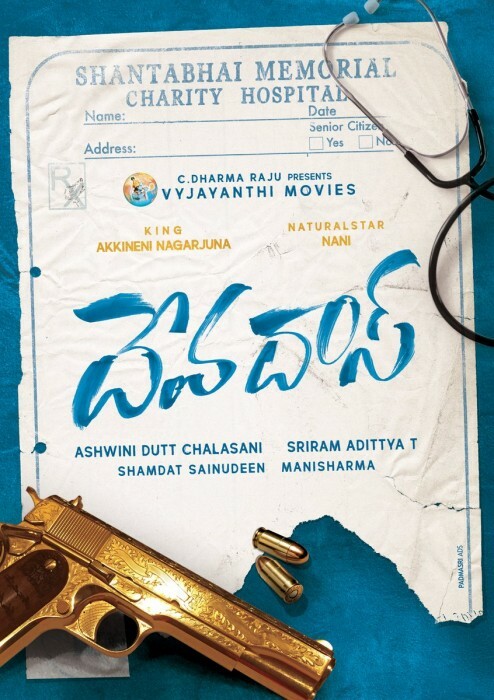 Devadas is being bankrolled by Vyjayanthi Movies and has music composed by Mani Sharma.